Another activity by volunteers from your Lake Association to monitor and protect the lake. Thanks to Eileen Thomas, Harlan & Linda Johnson, CC White, Sharon Natzel, Larry and Barb Roberts, Jack Derr, Betty Larsen, Jim Blodgett, and Joanne Torfin for all the help. The aquatic vegetation meander along the lake-shore shallows, back bays, and stumpy areas was completed on Wednesday, 8/23/17. On various excursions from August 11th to August 23rd a total of 11 participants focused their "eyes on the water" looking for any unusual plants not on our normal aquatic vegetation list. We bagged 2 plant varieties to check with the DNR and they were OK. Adding up the total hours involved comes to 60 person hours including the prep, boat driving, kayak paddling, wading, and cleanup time. The most interesting aquatic plant was the tiny white flower on a long thin stem which is the Elodea (the three leaf plant) getting ready for next spring. It's the winter bud process. The varieties of plants that we have on the lake can be found on our Long Lake Living website under Aquatic Plant Surveys: http://www.longlakeliving.org/p/plant-survey-2011.html. We spotted about 3/4ths of these plants in our meandering. The Faucet Snail is on the tip of the pencil. The LLAA Board of Directors wanted to let everyone know that the MN DNR has identified a couple of different snail species that are now found here in Long Lake. The good news is that they ARE NOT the Big Four Aquatic Invasive Species (AIS) mentioned in the recent Star Tribune article. Our Hubbard County AIS Program Coordinator, Bill DonCarlos, reminded us today to be sure to continue to practice prevention and reiterated the importance to clean, drain, and dry your watercraft and equipment. Dispose of unwanted bait in the trash. You may call 218-252-6738 to make a convenient free appointment to decontaminate your watercraft when going between lakes. The Faucet Snail is an intermediate host for three intestinal trematodes, or flukes that cause mortality in ducks and coots. Faucet Snails are also found on First Crow Wing, Second Crow Wing and Upper Twin Lakes in Hubbard County. There is no known treatment option at this time. Here are a couple of links that explain Faucet Snails more. 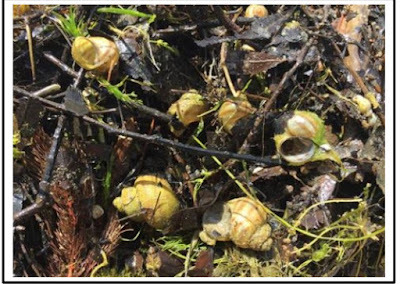 2) These nuisance Banded Mystery Snails (pictured below) were found when a family was cleaning their swimming beach near the northwest end of the lake. Another family on the northeast side of the lake has started a compost pile in their back acres with washed-up snails. The Long Lake Area Association Board of Directors checked into these one inch snails and learned they were first noticed in the lake in 2011. 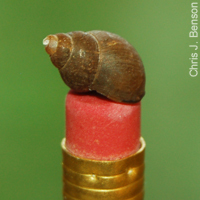 The Banded Mystery Snail is a species used in home aquariums. 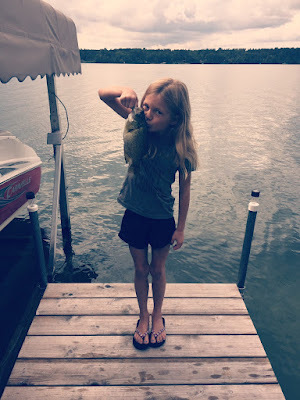 Please don't let the kids bring their "pretty shells" to another lake. There is no known treatment option at this time. They are called mystery snails because in spring, they give birth to young, fully developed snails that suddenly and mysteriously appear. After reproducing in their fourth year they die and their shells wash up on shore and smell. A letter in PDF form of this post can be found on the Board Communications Page. Teyla caught a Long Lake perch on July 20, 2017 while fishing from CC White's dock. 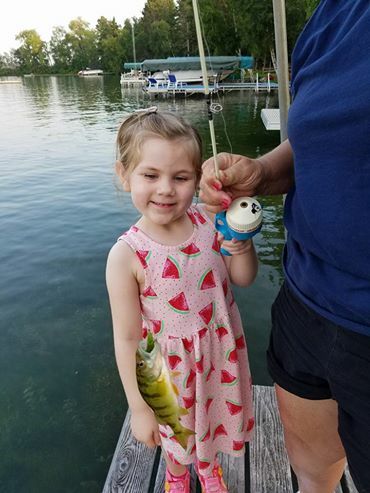 She was fishing with a small piece of watermelon colored Gulp Bait and her Mickey Mouse pole. 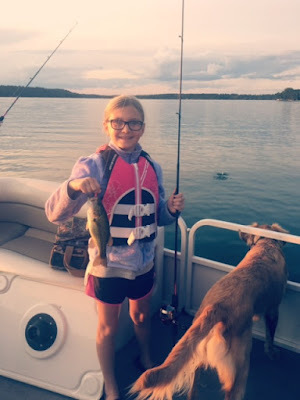 She likes to fish and to have her picture taken with her fish. 2) More Starry Trek: Participants willing to help search for Starry Stonewort on our Hubbard County lakes public access sites from 8:30am to 1pm on 10 next Saturday, 8/5/17, are needed. Please register here: https://www.maisrc.umn.edu/news/starrytrek-reg. You will get training on how to identify Starry Stonewort on that day, so no experience is needed. 3) Are you willing to help here on Long Lake for 3 hours? We will do our Long Lake Area Association (LLAA) aquatic vegetation meanders in the shallow water littoral area where vegetation grows to identify any invasive species on Friday 8/11, Tues 8/15 and Monday 8/21. We will need to troll along the water on pontoons, in fishing boats, in canoes or kayaks looking into the water (in the, hopefully, calm shallow waters) spotting vegetation that is out of the ordinary. Samples will be taken using a rake and identification tools. We will team up in 3-hour shifts with the desired goal to cover all the lakeshore in the LLAA neighborhoods in the 3 days. Contact Sharon at sharonmnatzel@gmail.com to volunteer or to get more information. Not into vegetation but like to be on the water? We will need pontoon/boat drivers. Enjoy the rest of the summer on on Long Lake!! The Firewise specialist's talk at the LLAA Annual Meeting was so important that we sent out this e-blast for those who were not at the meeting and also as a reminder for those who heard the talk. Based on local historical experience, Long Lake shores (especially the jack pine areas along the west shore) are considered possible tracts for raging fires. In such a case poorly maintained properties will burn while well maintained properties can often be saved. 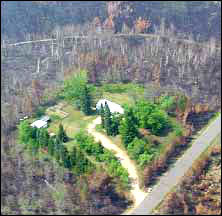 In a fire emergency your cabin or residence phone will be auto-dialed by the sheriff's office. In the case of an evacuation the evacuation route will be specified. 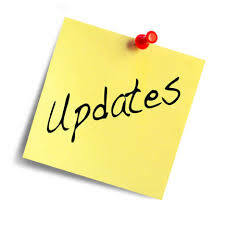 Cell phone numbers can also be on the auto-dial list, so please call the sheriff's office at 218 732-3331 to add your cell phone to the list. The Firewise Specialist, Dan Carroll, who spoke at our LLAA Annual Meeting invited folks to call him if they had specific questions that couldn't be answered through all the resources available. His office is in the lower level of the forestry building in Park Rapids.